John and I have pretty much been having a staycation this long weekend. We have friends over on the Island celebrating BC150, we took a day trip to Seattle, and yesterday we spent all of $2.50 in bus fare to experience the most amazing trails Metro Vancouver has to offer. As such, here is another installment of the Park Series featuring Lynn Headwaters. Metrics: 4,685 hectares with many “easy” to “expert” trails. 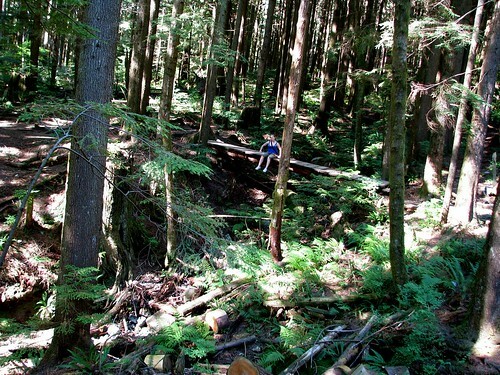 How to get there: North of Lynn Canyon Park, the Headwaters open up into vast mountain hiking terrain. Take Lynn Valley Road to its terminus and you’ll hit the parking lot. You can also take the 210 Upper Lynn Valley bus from downtown or 228 from Lonsdale that both let you off in the vicinity. There is a basic “loop” trail, and several kilometers of flat creek-side strolling. You will have to check in near the parking lot (and check out when you leave) and be sure to chose your route wisely as even on the easy trails there are several steep portions on the mountain (naturally). 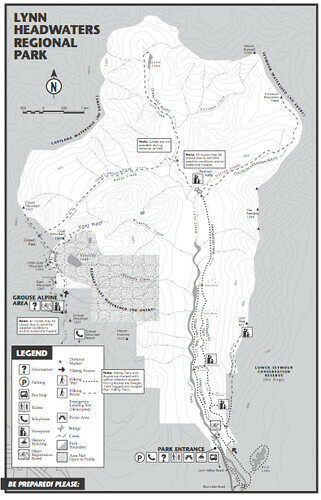 You can choose a relatively gentle, half-day creekside walk along the Headwaters Trail (9.5 miles/15.5 km return) to Norvan Creek, or a full-day trip to either Lynn Lake (15 miles/24 km return) or the top of Grouse Mountain on the rigorous Hanes Valley Loop route (9 miles/15 km one way) via Crown Pass. Features: Red cedars that are hundreds of years old and what we dubbed the “interesting boulders” the size of houses that are perched above the Lynn Loop trail. There are outhouses near the parking lot, some trails have muddy patches, there are loose roots and rocks so you definitely need to be careful. There is some great interactive information plus trail photos available on VancouverTrails.com. History: This was the home of North Vancouver’s water supply from 1883 to 1981. 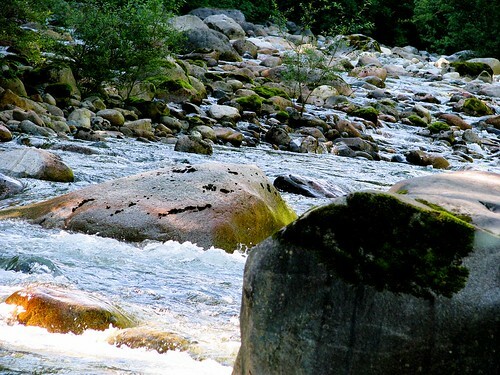 “In 1981, when storms damaged the intakes, Lynn watershed was abandoned as the source of North Vancouverâ€™s water supply; in 1985, Lynn Headwaters Regional Park came into being. This extensive wilderness area, logged in the 1800s, is now accessible to hikers.” [Trails.com] Considered “logged out” by the late 1900’s, this area was also mined for zinc and copper. The next time I’m in the area I’m going to stop at the Lynn Valley Ecology Centre for a free lesson about the natural history of the park. Notes: Remember to bring bug spray because when you stop at the top of that 1km incline for some rest, the flies and mosquitoes landing on your legs, feet, back and chest might drive you batty. Dogs are allows on leashes. Be bear aware. Dozens of people have had to be rescued from the park over the last few years so make sure if you anticipate going up on the trails that you are fully prepared, give yourself lots of time before dusk, check the weather reports and always let someone know where you are going. Although this is mountain hiking territory, trails like Lynn Loop, Cedars Mill and the lower Headwater route provide nice afternoon walks (40 mins – 2 hours). My favorite blog post all day thanks to the inclusion of “hectares”. Just a relaxing stroll in the woods, no wild life encounters? I see signs of “bear aware” everywhere, but I haven’t seen a bear in BC since I’ve moved to Van 4 years ago, except for the caged ones on Grouse Mouintain. @ Luc I used to see coyotes all the time but I saw my first bear in Metro Vancouver proper driving down Cypress the other day. @ Phaedra we plan on going back for sure, now that we know what to expect, how to get there etc. there are so many possibilities. I love Lynn Valley. JT and I go there quite frequently (I am sure I have got some photos on my Flickr). Great post, Rebecca, as always. I love how you mentioned that it was a mere $2.50 to get away from the city to hike through some beautiful headwaters’ territory, and how you are active “tour-idents” in the city you inhabit. The dang ole bears are roaming through my yard by Lynn Valley a couple nights a week – gotta be smart with your trash. Remember, Headwaters is just a wee but upriver from the free LV suspension bridge, however the swinging bridge can be quite busy on summer weekends.